The local soiled doves are making a killing, some say ghosts walk the streets, and a mad serial killer is on the loose. And there's more, amigo! Lots more. A group of outlaws have hatched a vengeful scheme to get even with the locals, a new preacher is stirring up trouble, and a mysterious shaman fortells dark tidings from the nearby hills. Coffin Rock, better hope it doesn't put you in the ground. 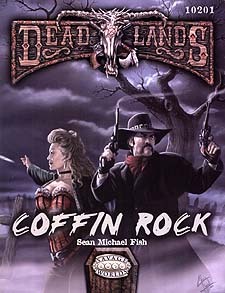 Coffin Rock is a rootin' tootin' Savage Tale for the award-winning Deadlands RPG.